In 2015, Te Papa is creating a teacher resource to support you to ‘do science’ in your own backyard/outdoor environments with young children. 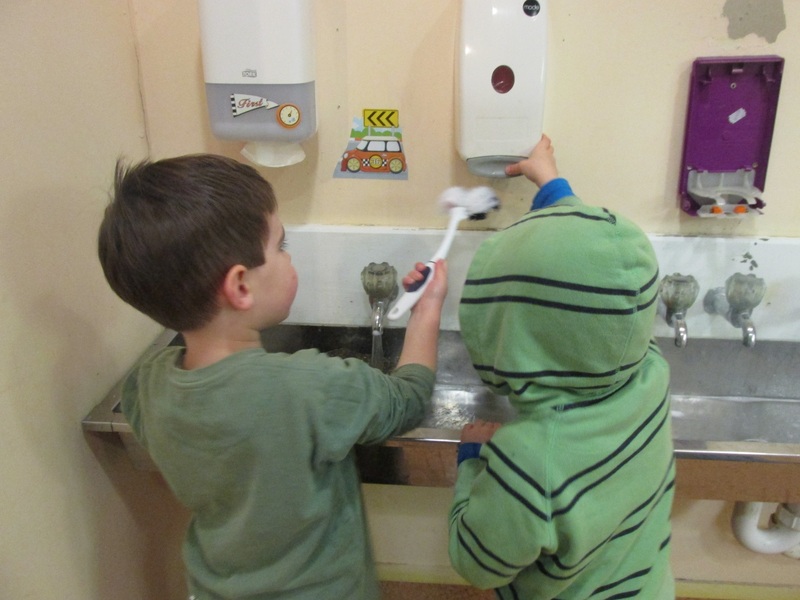 We have been collaborating with three Wellington region ECE centres in its development. 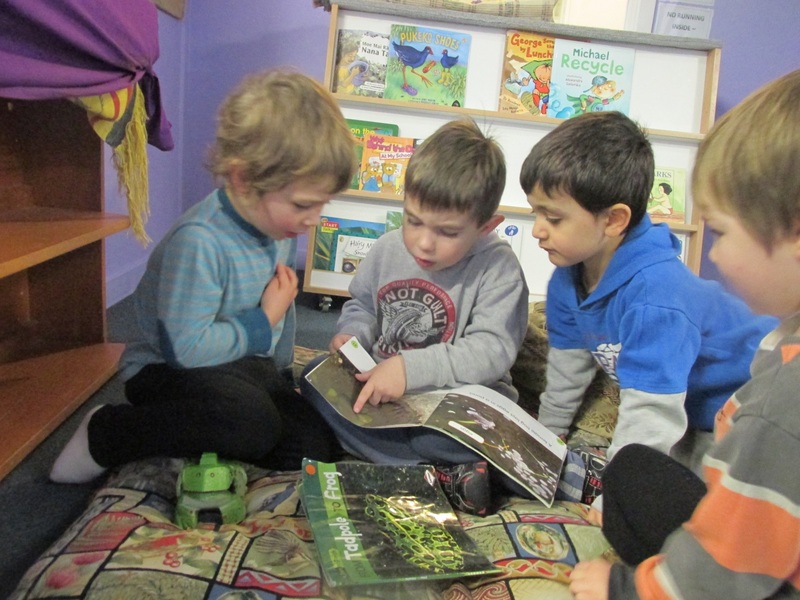 In our project updates on this blog from Imagine Childcare and Raumati South Kindergarten, we have seen quite different approaches and journeys taken. 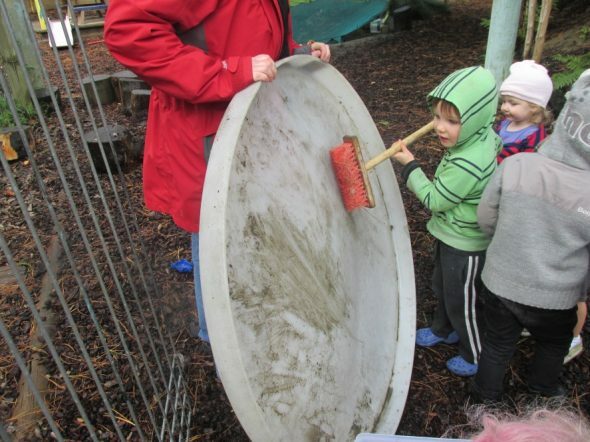 It is quite exciting to see that Kiwi Kids Early Childhood Centre from Karori, our third collaborative partner in this project, have gone yet in another direction again! After spending time observing and thinking about the invertebrates found in their playground (including centipedes, cicadas, ants, worms and moths), they have applied their growing scientific capabilities to the study of tadpoles. This tangent is child-led – the result of Cillian gifting some tadpoles from his grandparent’s pond to the centre. 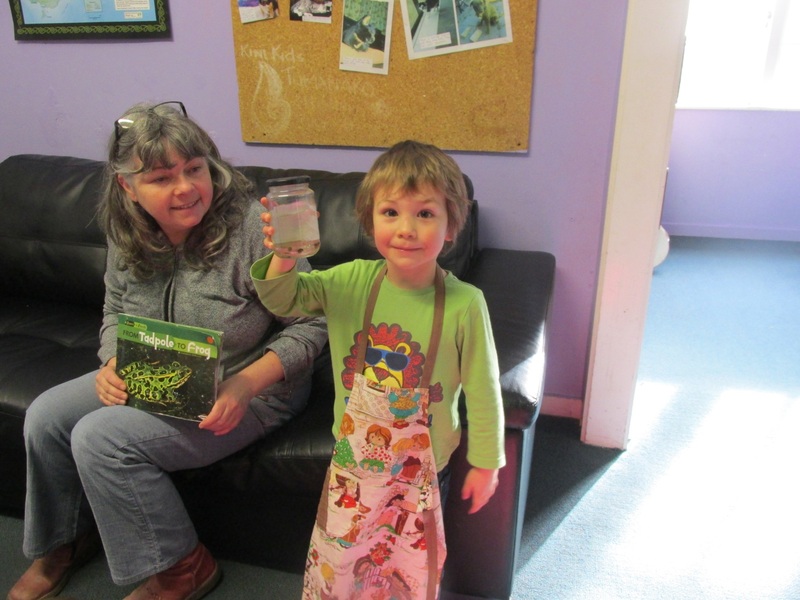 Cillian has been one of our most enthusiastic scientists taking part in the It’s a Bugs Life project alongside Te Papa Education. On the 3rd of June, he brought in something very special to Kiwi Kids that he and his whānau thought would add to our experience. It was a jar containing 4 recently hatched tadpoles! He gave them to us so that we can watch as they turn into Brown Tree frogs. 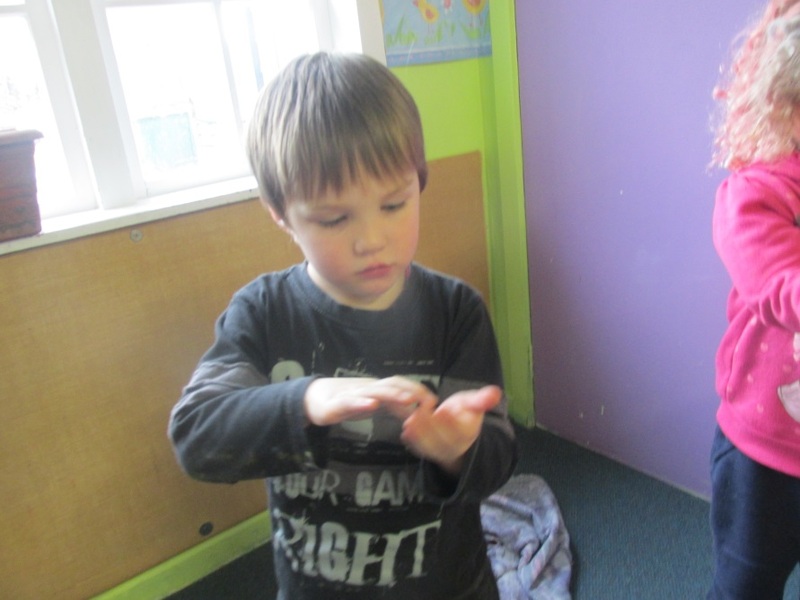 Cillian spoke about the tadpoles at mat time, and told us that the tadpoles had come from his Nana and Poppa’s farm which is in Nelson. The tadpoles came across Cook Straight on the ferry with him and his family, so they really are a long way from home! Cillian has some tadpoles at his house too, so we think that it will be interesting to see if the tadpoles at Kiwi Kids develop at the same rate that the tadpoles do there. As we all found the tadpoles so fascinating right from the beginning, we of course wanted to know all about them! A group of the children found some books about frogs from our library, and read them with others independently in the book corner. At mat time, Donna (kaiako) read one of the non-fiction titles so we could all develop some understanding about a frog’s lifecycle. We had a korero (discussion) at mat time too, and decided that we needed some children to be responsible for the welfare and well-being of the tadpoles. Cillian, William and Genet are subsequently our ‘tadpole teachers’. 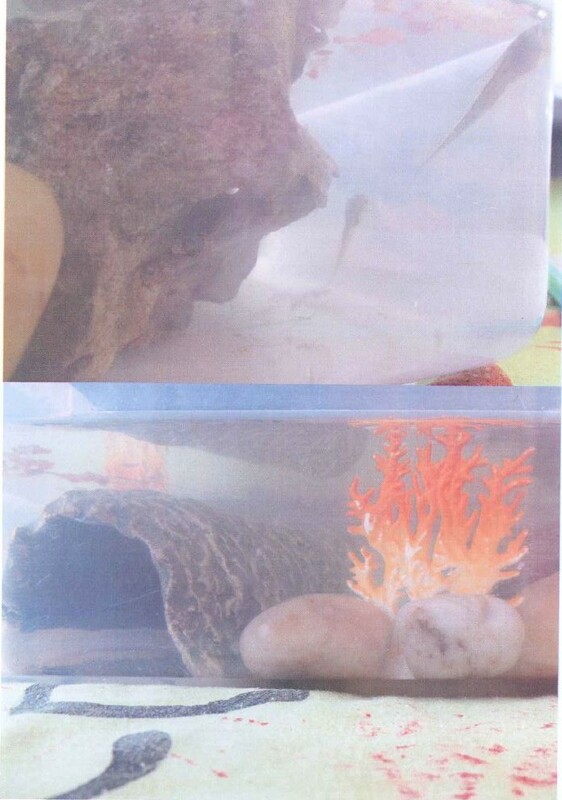 We also decided that having a suitable tank, and collecting water for the tadpoles to live in were a priority. Did you know that tadpoles cannot live without water? As we don’t have a pond here at Kiwi Kids, we had to use our problem solving skills. We could not use tap water because it has chemicals in it that harms the tadpoles, so we thought that rain water might be a good substitute – seeing as the rain helps to fill up ponds anyway. We scoured our outside environment and sourced rain water from ledges, leaves, the sandpit cover and even containers which had been left outside overnight. In our first days with our new study specimens, we also set up a longer term water collection system too. When it starts to rain we put the water trough cover upside down to save it. Simple but effective! We know that we need clear water for our tadpoles so that they are happy and healthy, but also because it makes it easier for us to observe them. We have put steps into place to make sure this happens too. 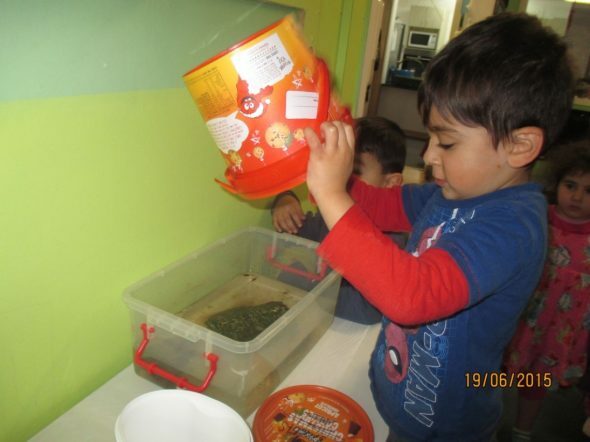 Hari even took it upon himself to collect some rainwater from his home for the tadpoles. He found water in his family ‘peg bucket’, and carried this (minus the pegs of course) all the way into Kiwi Kids the next day so he could pour it into the tank himself. We collected things from outside to put in the tank for the tadpoles too, so that this habitat felt more ‘pond like’. This included a large concrete rock, that the children decided needed a bit of cleaning first too! The rock will be very useful to the tadpoles when they have grown all their legs, and need to get out of the water. We wondered… what do tadpoles eat? To help us answer this question we asked some people who have kept tadpoles before for their advice. 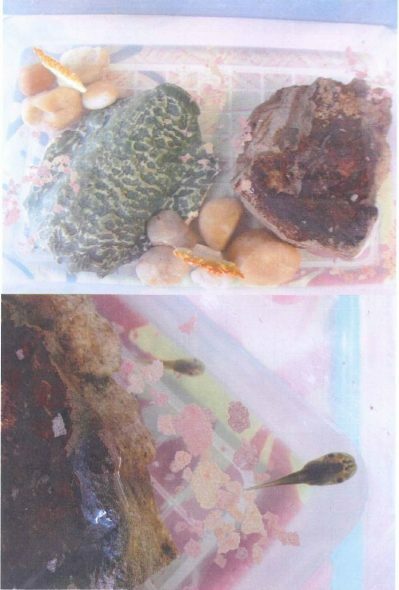 Curdin (Cillian’s dad) told us that tadpoles can eat boiled lettuce leaves, and Alice (Donna’s mum) told us that tadpoles can eat cold water fish food – but that it needs to be ground up lots because tadpoles have very small mouths. We bought some fish food for the tadpoles to see if our ones liked it too. After a few days, we decided that the tadpoles were definitely eating the food, because we could observe that they had done lots of poos in the water. 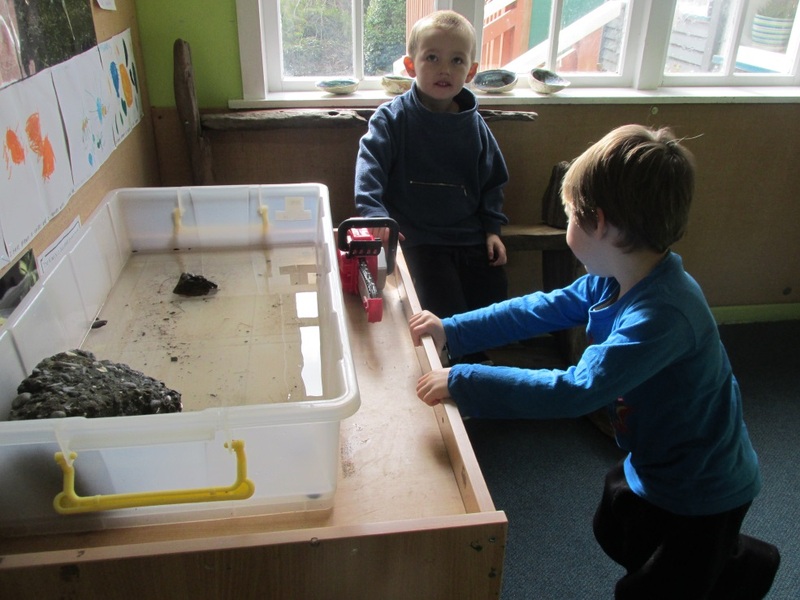 Observation is key to science, and so the children have made watching the tadpoles part of their daily routine. As they get to know more of their behaviour, they share this new knowledge with others too. For example, Mia (a tuakana/ older child) supported Victor (a teina/ younger child) to learn how to feed the tadpoles. She explained to him that they were swimming and grouping together to come and eat the food. Another wonderful outcome of this routine is that it has given children new to the centre a real sense of belonging. During the at least five minutes Victor watches the tadpoles every morning, he will sometimes speak to them in his home language of Chinese. 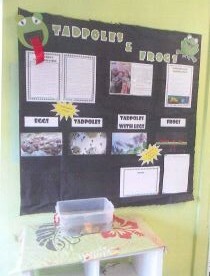 We have created a tadpoles and frogs project wall so that we can collect and display all of the wonderful mahi (work) done by kaiako and tamariki. As we add to it regularly, it has grown and evolved a lot in only a short time. 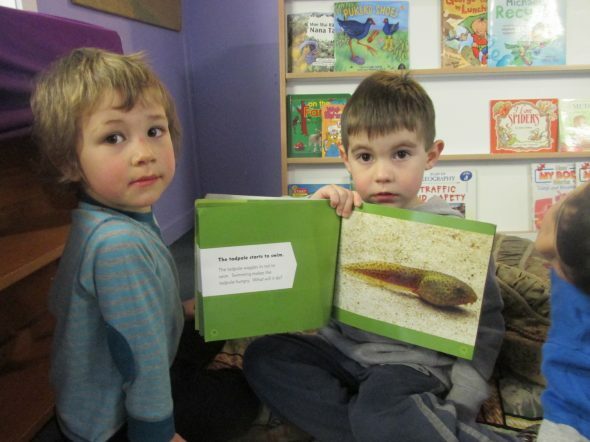 Our whānau use our wall as a way to connect to what we have been doing in the centre – so we are using our growing knowledge to help to educate them about NZ frogs too. We take pictures of our tadpoles from various angles to help to pin-point their progress through the lifecycle. At the time of writing, they have grown their back legs. This is a tricky stage for the tadpoles, so we are doing our best to keep them happy and healthy. We also make sure to record what we see at morning and afternoon feeding on our Feeding Chart, and we keep a tadpole calendar so that we know when important tadpole related tasks need to be carried out. We look forward to seeing where this journey takes us over the coming weeks and months. Ka mau te wehi! What awesome work you have done Kiwi Kids ECE. It is really great to see how the skills and dispositions you have developed as part of the It’s a Bugs Life resource project can be applied so easily to the study of vertebrates (creatures with backbones) too!